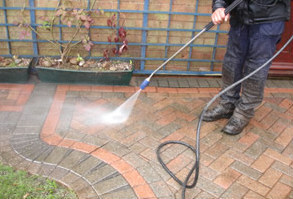 AfterTheBuilders Ltd. is among the top providers of patio cleaning services in London. Give us a call today to get a free non-obligatory quote! In order to make any dirty spot sparkling clean, the cleaning professionals put all the items aside and dispose the broken or unnecessary ones. The second step is the removal of the weeds that have grown between the stones. They will be pulled off or scraped. Another alternative is treating them with various detergents that reduce their growth. The next procedure is sweeping the debris and disposing them. The patio cleaning procedure is not completed until all the loosened dirt is taken care of. The professional pressure washing machine is irreplaceable for making the patio clean. 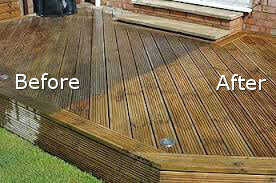 However, the pressure washing procedure should be performed by a professional who knows how to adjust the jet pressure and avoid any damages the improper treatment can bring about especially if the patio has wooden elements. If the patio furnitures have been exposed to snow and rain, they probably have mildew stains and moss. They will be completely removed with appropriate tools, powerful equipment and top – quality detergents.